I’m in love with our yardlet! 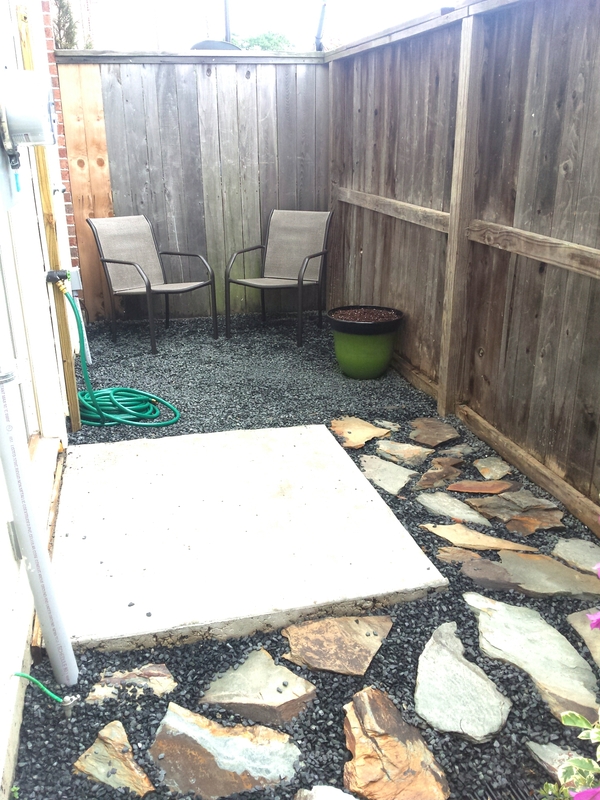 (Tiny patio space). 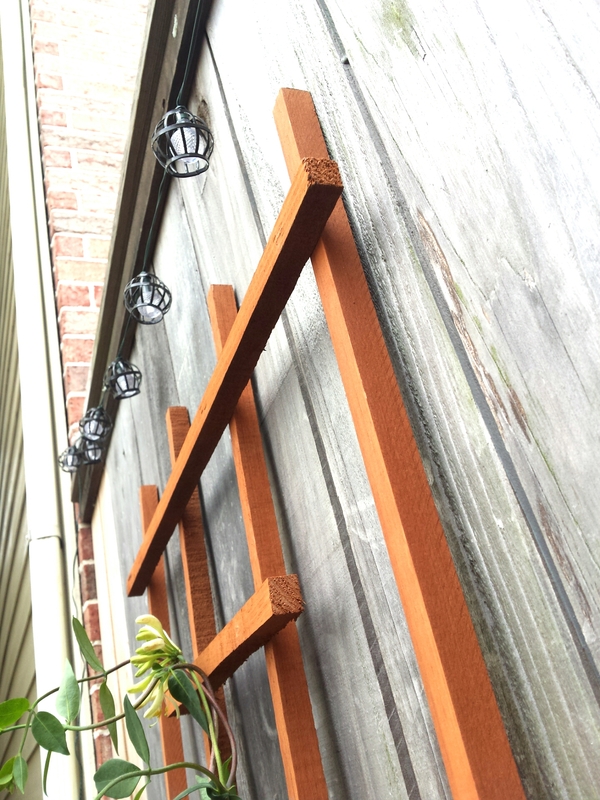 Ever since seeing the tiny spice behind our townhouse I’ve been dying to turn it into tiny garden space. I envisioned a simple space were we could read that would glow with tiny lights at night and after 3 weekends of brainstorming and working on it my vision is a reality! Especially thanks to Big Al who did so much of the work! The first thing that we did was buy a bougainvillea. 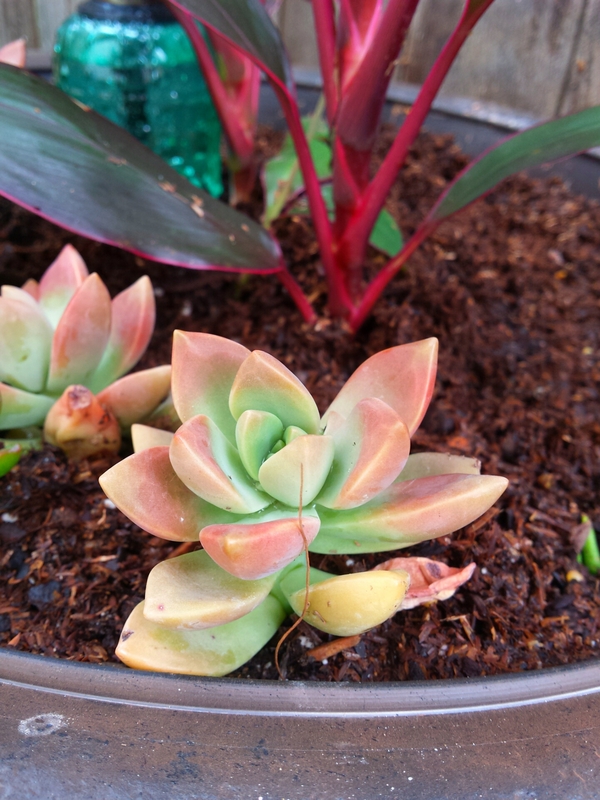 We saw it at home depot and I fell in love with it! I was nervous to buy it though because it was $90 and I was worried I would kill it. That seems like a lot of money to spend on something I might kill! Big Al convinced me to buy it so we took it home, planted it, and have kept it alive since then! 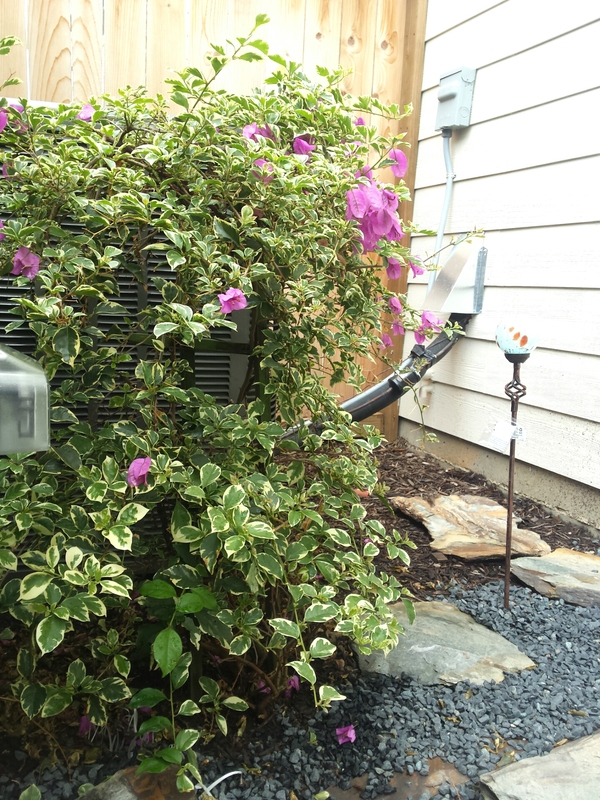 It does a great job of hiding our air conditioner and looks amazing! That is the only thing we did that weekend and it was definitely a gateway drug to the rest of the work to come. The next thing we did was remove all the mulch that was put there by the builder and laid down weed barrier. Then laid down grey gravel and slate stones. 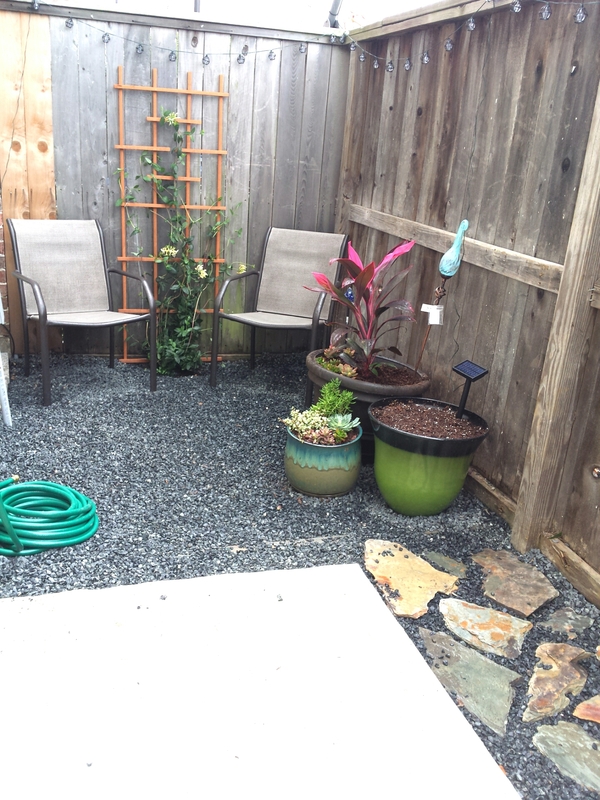 We laid down slate stones on the left and only gravel on the right to give the effect of two separate spaces. 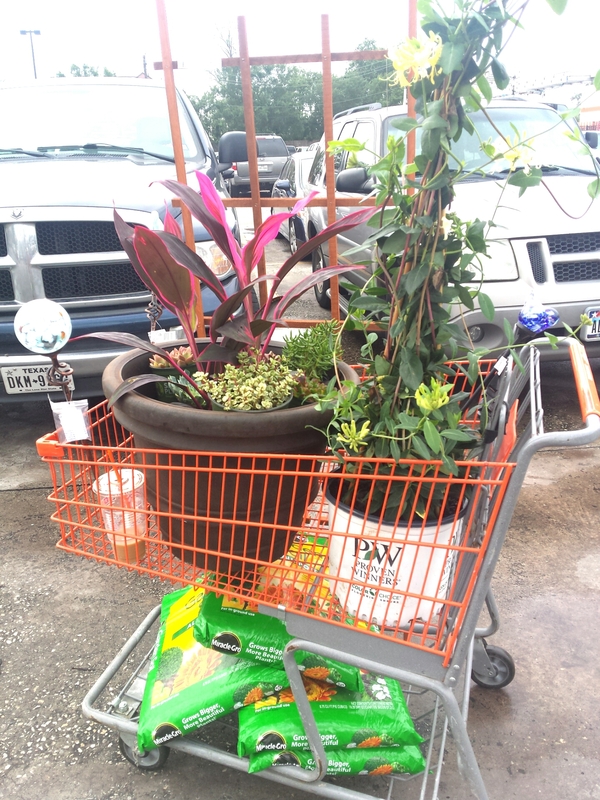 This part took us two weekends, 3 trips to the rock yard and a little less than $200. I wish I had a picture of what it looked like before because the rocks helped the space feel twice as big. It was disgusting before so it’s no wonder I didn’t take a picture. 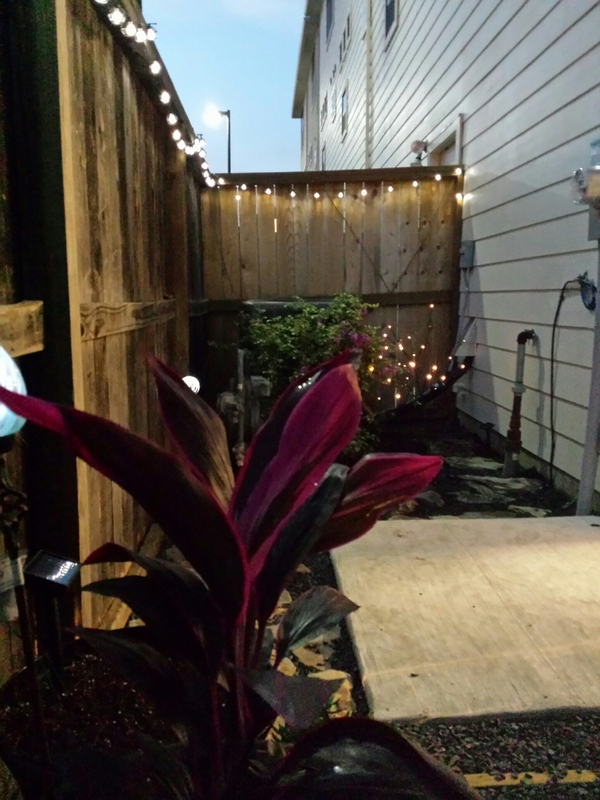 Also on the third weekend we planted the honeysuckle vine, put in three potted plants and hung lights on the tip of the fence. Shopping cart stacking should be in the Olympics. 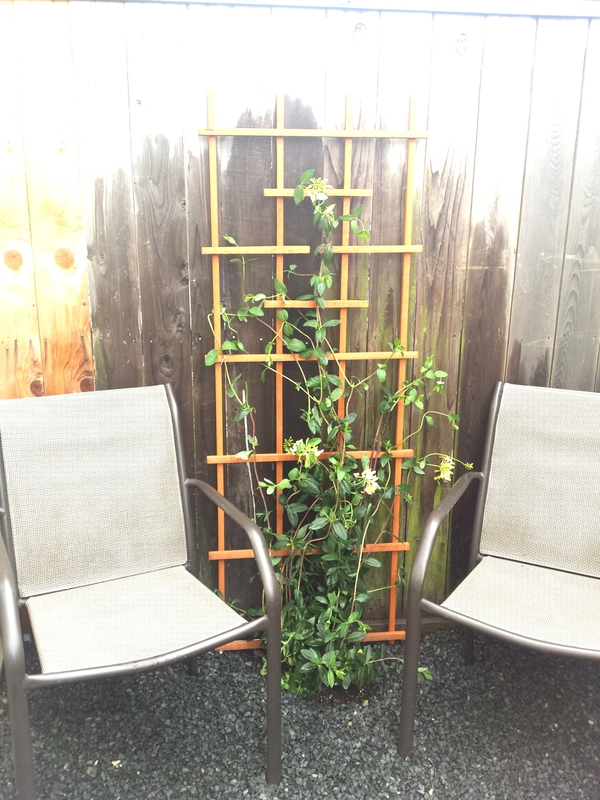 The honeysucle is scentsational and I can’t wait for it to cover the trellis! The two biggest pots are plastic so they were much cheaper! Also they are so much lighter and won’t break if they get dropped. The green pot on the right has basil seeds in it so it should be a great green pop when it starts growing. 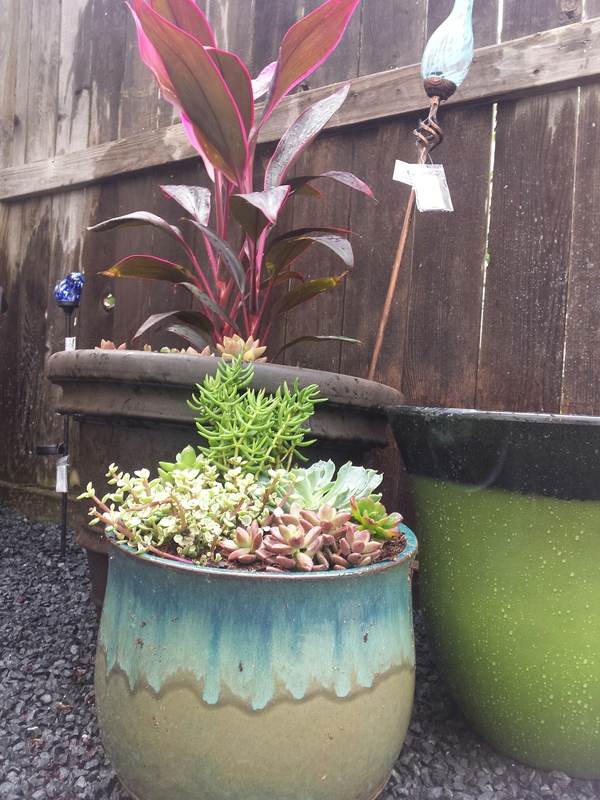 The red plant is a Ti plant, I really liked the height and the color of this little guy. 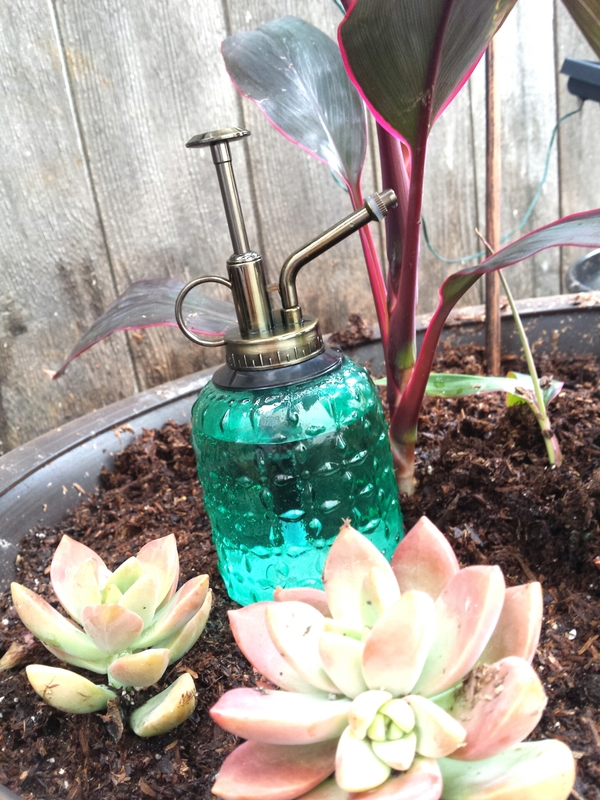 The smallest pot is full of succulents. 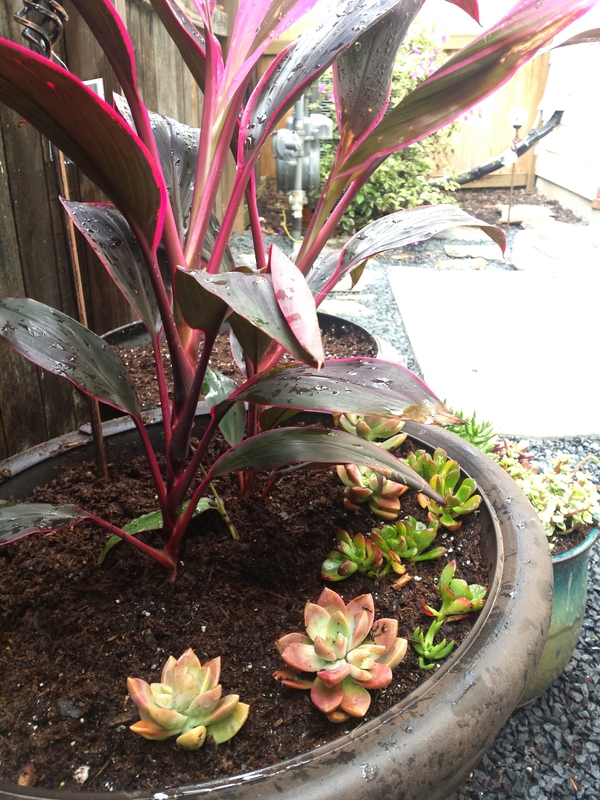 I decided to buy a bunch that I liked and then I put them all in one pot. I had some extras that I put in with the Ti plant even though I’m not sure if they will grow well together. It looks cute though. The blue rod is a solar light up bulb that will add some twinkle at night. 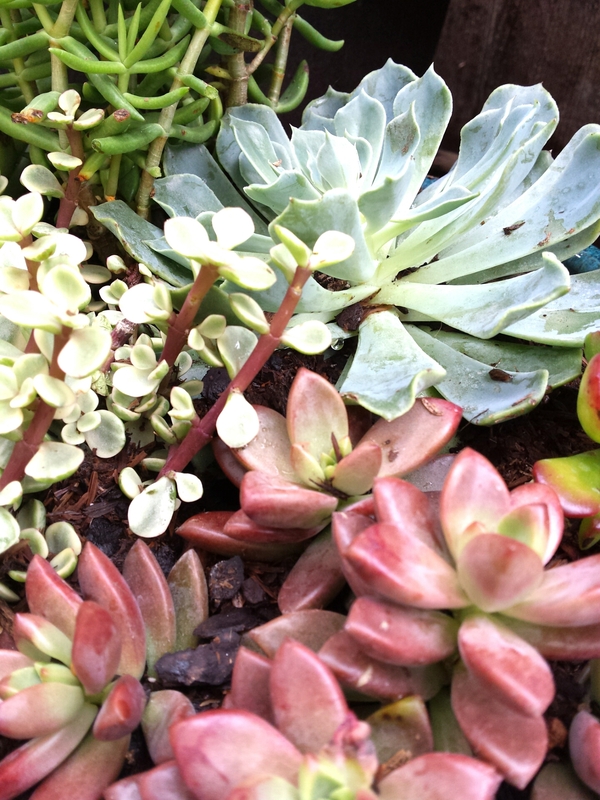 I think the succulents are definitely my favorite part right now, they are all so perfectly tiny! The lights we got are also solar lights so they will light up automatically every night for even more twinkling! From Tarjay (commonly known as Target). All in the improvements cost us about $550. Now I just have to keep all these freaking plants alive. Ironically, I’m a little stressed about the keeping them alive part. 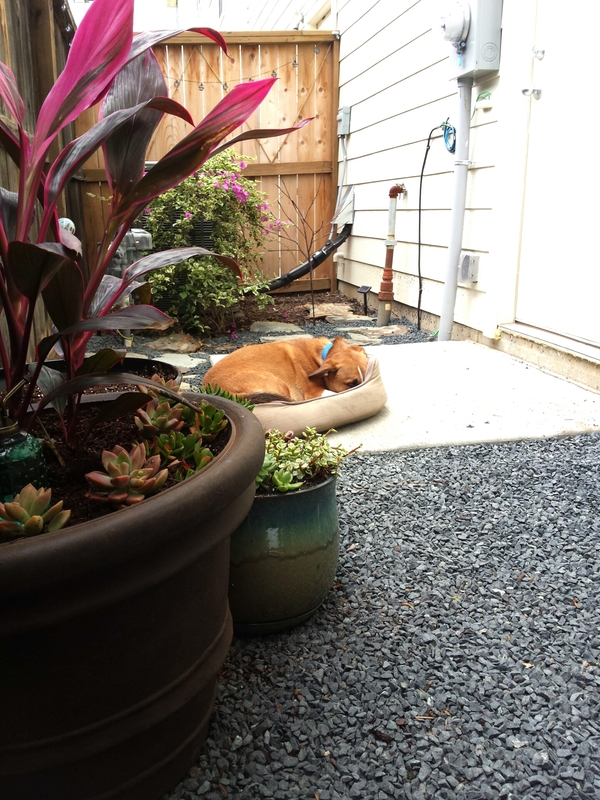 My dog loves dog beds so I brought it outside for him. He is spoiled.